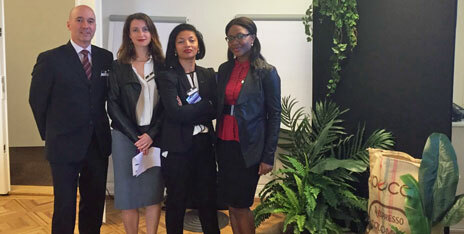 Four MBA students from Nottingham University Business School recently made it to the final of a global competition searching for suggestions on how to improve sustainability at the Nespresso coffee company. The quartet were finalists at the 2016 Nespresso MBA Challenge, one of only three teams – from a field of 86 MBA schools across 28 countries – invited to Nespresso headquarters in Lausanne to present their ideas in detail to a panel of international judges. Entrants to the competition were asked to come up with new ways to inject ‘sustainability and shared value’ into the Switzerland-based coffee business. The Nottingham team of Liz Corbishley, Romiary Voos and Andrew Scyner, who are studying for our MBA in Corporate Social Responsibility and Jeti Olafimihan, the MBA in Entrepreneurship – made it to the final after two rounds of reviews by experts earlier in the year. The other two teams were from INSEAD Singapore and Said Business School in Oxford – with the Oxford team running out winners. In front of the panel of Nestlé-Nespresso executives, as well as academics and sustainability experts, the Nottingham team members expanded on ideas they had put forward after analyzing a case study based on the results of research carried out on Nespresso’s sustainable sourcing of coffee. Each team was allowed to be guided by a faculty member acting as coach – in Nottingham’s case Paul Caulfield, Assistant Professor in Responsible and Sustainable Business at ICCSR. Team member Liz said entering the competition turned out to be an ‘extremely useful’ exercise and ‘a way of consolidating everything we had learned in the first semester in one practical project’.